Hi, friends. Aida here from Salt & Wind. The minute Fall arrives, it’s go-time on sweet potatoes in our house. Never mind pumpkin spice, we’re all about sweet potatoes, whether it’s something as simple as a whole grain bowl with sweet potatoes or something more over-the-top like these curly fries. What’s one recipe that’s sure to become a regular this Fall? These Sweet Potato Stacked Enchiladas. As you know, my recipes are always inspired by where I’ve traveled and that’s exactly the case with this one. On a recent trip to the Southwest, I had an insanely good version of the TexMex classic, stacked enchiladas, and wanted to remake them ASAP. If you haven’t had them before, it’s basically an enchilada casserole that’s easier and healthier than regular enchiladas because there’s no need to first fry the tortillas and roll them since, well, everything’s stacked! One way I’m making them even healthier is by adding in sweet potatoes. To be honest, this recipe is unlike any other stacked enchilada I’ve come across because there are layers of sweet potatoes where you’d normally use tortillas. That means this is a healthy-ish recipe that’s perfect for a weeknight meal and even more perfect if you’re cooking for a group with a range of dietary restrictions. Because, whether you’re paleo, gluten-free, low carb or just want more veggies, these Sweet Potato Stacked Enchiladas are pretty perfect. 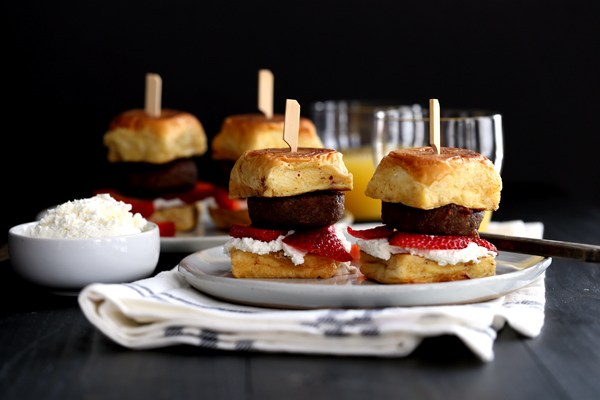 Let’s get back to those layers and layers of perfectly sliced sweet potato. I know, normally, slicing sweet potatoes (or any vegetable) that evenly would be a pain, but it’s way easier thanks to the KitchenAid® Vegetable Sheet Cutter Attachment. Using the Thick Blade, you can slice the sweet potatoes to the perfect thickness so they sub in for tortillas like a charm. Around our house, we’ve been using the Vegetable Sheet Cutter attachment with zucchini to make easy hand rolls, and with apples, almond butter, honey, and toasted granola to make an afternoon snack of stacked Napoleons. But that’s really just the start; you can do a lot with the Vegetable Sheet Cutter Attachment! 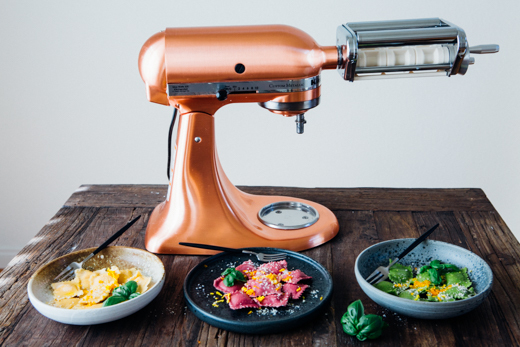 Here’s the deal: anywhere you’d use pasta sheets, tortillas or rice paper, you can use cucumbers, zucchini, squash, potatoes, other veggies and the Vegetable Sheet Cutter Attachment to create vegetable substitutes. First, start by making the chicken. This is the same way I make chicken for anything with TexMex flavors like, say, tostada salad, classic enchiladas or chilaquiles. Heat the oven to 400° F and arrange a rack in the middle. 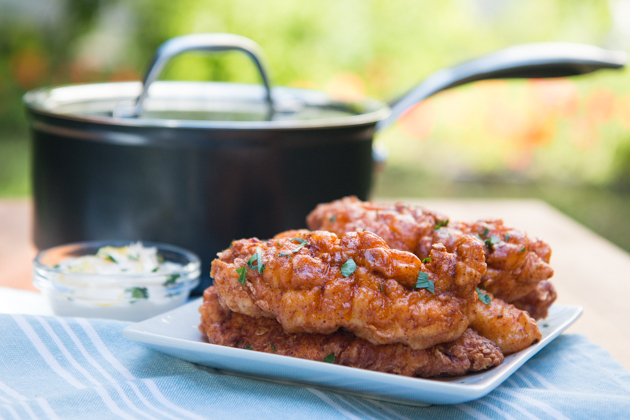 Place the chicken in a 10″ Skillet from the KitchenAid® Hard Anodized Nonstick 10-Piece Set. Add the olive oil, chili powder, onion, and garlic then turn until the chicken is well coated. Cover the pan with aluminum foil and bake the chicken until it’s thoroughly cooked and the juices run clear, about 20 to 25 minutes. Set aside until it’s cool enough to handle then shred into bite-sized pieces. By the way, the chicken can be cooked and shredded up to two days in advance, but just store it covered in the refrigerator until you’re ready to use it. While the chicken is cooking, go ahead and start making the sweet potato sheets. To do so, attach the Vegetable Sheet Cutter Attachment to the power hub of the KitchenAid® Stand Mixer. Fit the Vegetable Sheet Cutter Attachment with the Thick Blade. Trim the ends off the sweet potatoes then insert the Food Holder all the way into one end of the sweet potato. Place the side with the Food Holder onto the main body of the Vegetable Sheet Cutter Attachment then twist it clockwise to lock it in place. Insert the Skewer into the skewer support on the main body of the Vegetable Sheet Cutter Attachment, making sure that it is centered on the food. Switch the Stand Mixer to the Stir Setting. Pull the lever of the Vegetable Sheet Cutter Attachment toward the Stand Mixer and lift up on the blade release lever to unlock the blade carrier. Rotate the blade carrier slowly until it comes into contact with the food before letting go. Process all the sweet potato sheets then cut each sheet crosswise every 4-6″ so you have squares. These will sub in for tortillas so you want them to be about that size. By the way, you’ll have some sweet potato scraps — go ahead and gather them and bake them off to make sweet potato chips! Once the chicken is shredded and the sweet potato sheets are done, you’re ready to assemble the enchiladas! Go ahead and clean out the 10″ Skillet then layer 3-5 pieces of sweet potato squares until slightly overlapped and the whole bottom of the Skillet is covered. Spread with the chicken, black beans, and corn kernels. Top with 1/3 of the Monterey Jack cheese, the feta or Cotija cheese, and the salsa verde. Repeat to make another layer then top the stacked enchiladas with the remaining salsa and cheeses. Mix the sour cream with just enough cream or milk to make it pourable then spread over the top of the casserole. Bake the enchiladas until the edges are bubbly and the sweet potato pieces are easily pierced with a sharp knife, about 20 to 30 minutes. Remove the enchiladas from the oven and let cool slightly, at least 15 minutes. Top with jalapeños, green onions, cilantro, and lime cut into wedges. Serve and enjoy! 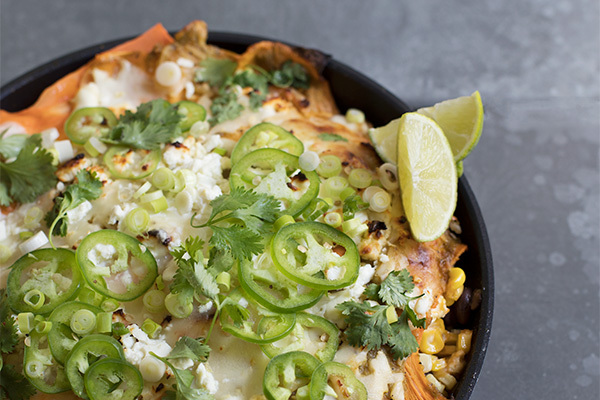 Share your take on these Chicken & Sweet Potato Enchiladas on Instagram using #ForTheMaking for a chance to be featured. Heat the oven to 400° F and arrange a rack in the middle. 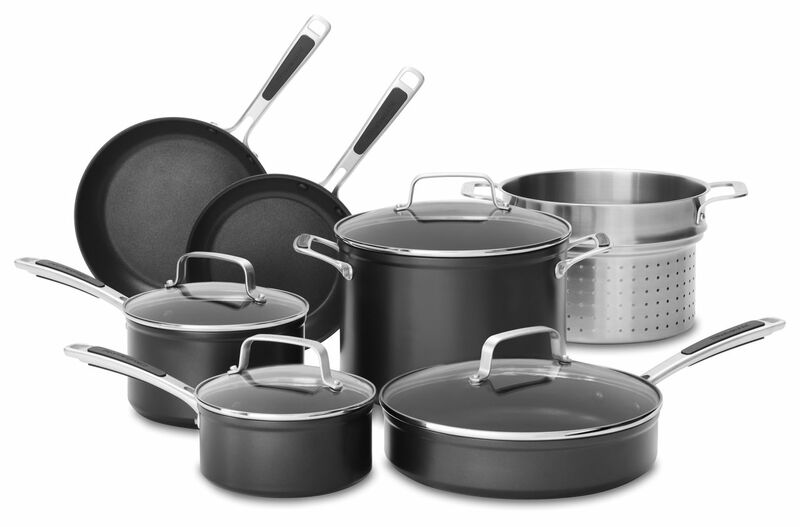 Place the chicken in a 10″ Skillet from the KitchenAid® Hard Anodized Nonstick 10-Piece Set. Add the olive oil, chili powder, onion, and garlic. Turn until the chicken is well coated. Cover the Skillet with aluminum foil and bake the chicken until thoroughly cooked and the juices run clear, about 20 to 25 minutes. Set aside until cool enough to handle then shred into bite-sized pieces (chicken can be cooked and shredded up to two days in advance). 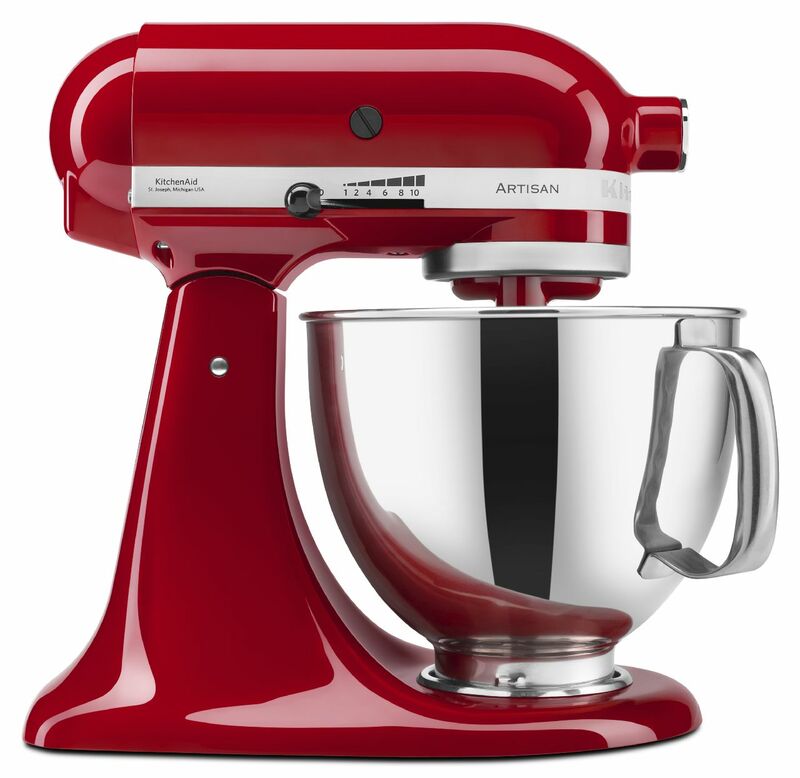 Attach the Vegetable Sheet Cutter Attachment to the power hub of the KitchenAid® Stand Mixer. Peel and trim the sweet potatoes to fit the Vegetable Sheet Cutter Attachment. Mount the sweet potatoes on the Skewer then fit onto the Vegetable Sheet Cutter Attachment. Switch the Stand Mixer to the Stir Setting then cut all the sweet potato sheets. Cut the sheets into 4-6″ lengths. Once the chicken is shredded, clean out the Skillet and layer 3-5 pieces of sweet potato squares until slightly overlapped and the whole bottom is covered. Mix the sour cream with just enough cream or milk to make it pourable then spread over the top of the enchiladas. Bake until the edges are bubbly and the sweet potato pieces are easily pierced with a sharp knife, about 20 to 30 minutes. Remove the enchiladas from the oven and let cool slightly for at least 15 minutes. Top with jalapeños, green onions, cilantro, and limes cut into wedges.